One of the reasons I wanted to travel to Japan was to be able to view sakura. We thought that we had timed it correctly for viewing but it was in full bloom in Tokyo when we landed, which was at 10:00 p.m. We were also leaving early the next morning for Fukushima and knew that when we returned to Tokyo, the season would be over. We went out for an early morning walk within the hotel area, which was in Nihonbashi and were fortunate to catch a few trees in bloom. Once in Fukushima, we did much sightseeing and saw many wonderful things but the weather was cold until late this year and it was quite unfortunate that we didn't get to see any sakura. Sakura season in Fukushima was running a week to two weeks late. There was even a Sakura Matsuri (Festival) held in Wakamatsu at Tsuruga-jo. No sakura, only buds. We were told it looked like we would be leaving Fukushima and then within a few days it would be blooming. Not to be discouraged, we did some research the day before we left Fukushima and found out that in Utsunomiya, sakura was still blooming. We got off the shinkansen (bullet train) at Utsunomiya Station and a very helpful worker outside the station helped us to catch the bus to the park that we wanted to go to. It was just a short bus ride to Hachimanyama Park. We first went to the shrine grounds and found beautiful sakura there. The shidarezakura (weeping cherry) was in this area and they are my favorite. Once we got into the park, the view was just breathtaking! It was so beautiful. 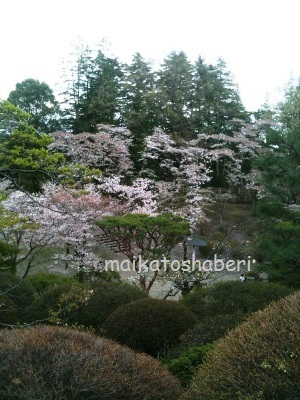 Trees were in full bloom in different shades ranging from white to dark pink. There were people doing hanami (flower viewing) while enjoying lunch, and many people just walking and enjoying the serenity of the petals flowing in the air from gentle breeze. We were so glad that we were able to finally see the beautiful sakura. It is no wonder that it is a beloved flower of the Japanese people. Once we headed back to Tokyo, we met up with our good friend. The following day, we visited her father's working place and his secretary told us that there is a special sakura tree close by. Amazingly, even our friend didn't know about this tree even though it was in close proximity to her home. This is not a common sakura. Did you know that there's such a thing as green sakura?! From afar, it looks like a regular tree with green leaves but all that green is sakura. How fortunate we were to be able to view this sakura, known as gyoiko. We also learned that after the regular sakura season is over, the multi-petal sakura starts to bloom. I'm sorry, but I don't remember the name of this variety. These are really pretty too and the blossoms are quite large. EDIT: Thanks to K of Cosmeddicted, she told me the name of this sakura is Yae zakura, which means 8 layer sakura. If you look closely at the first picture, toward the bottom center, you can see my husband's thumb in between the blossoms. It gives you an idea of how big these blossoms are. Seeing the sakura in their natural environment, my love for these blossoms has grown even more. It has been and continues to be my favorite flower. P.S. If you click on the picture, you can view it in a larger size. WOW beautiful! I didn't realise there were such thing as green sakura!! :O Learn something everyday! Glad you were able to see them in their natural environment! I'm glad you were able to see the Sakura in bloom and even see green Sakura! I've not seen those before! I miss the Sakura season, it's one of my favorites in Japan. I adore adore adore this entry. I hope someday I can have my own 'sakura chase' - definitely something on my bucket list! @Beauty Box--YES! Green sakura! My relatives who were born and raised in Japan and still living there couldn't believe it themselves. Thank you so much! I'm glad that you enjoyed my pictorial. @Jian--It was also the first time I heard of green sakura as well. It was icing on the cake that we got to see such an extraordinary flower. @Brianna--Once you've seen sakura in full bloom like this, it really stays with you, touches you and in many ways humbles you. It is a feeling that will stay with you and like you, will make you yearn to see it again when sakura seasons comes again. @Justine--I can honestly say that I was thinking of you as I wrote up this post, knowing how much you love sakura too. You defintely need to check this off your to do bucket list as having been done. @Diana--Thank you! Sakura is truly a beautiful flower and I'm glad you got to see it while you were in Korea! Stunning! I wish I could enjoy Sakura season in Japan. Did you speak Japanese while visiting Japan? The sakura are so beautiful!!! @Sandy--Seeing sakura in their glory was so awesome. There's a feeling of reverence that overcomes you. Yes, I spoke Japanese, as limited as my ability is. Fortunately most of our time was spent with my son who can speak both and a friend who can also speak English. @Old Cow--I love sakura! After seeing it in person in full bloom, I have an even deeper appreciation for it.